Today is the last day to receive your 20% off discount on Christmas stamps! We are done with shows for 2015! Thank you to everyone who stopped by our booth this year. We had a blast meeting all of you, doing make and takes and demos, and sharing our love of stamping with you. Next year brings all new opportunities -- we will be exhibiting at 22 different venues in 2016. Check out the TJ website within the next month for our full tradeshow schedule for next year! This is it! Day 30 of the 30 Days of Christmas. 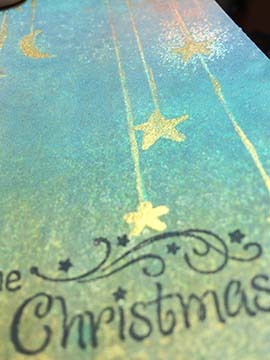 Today is the LAST day for the 20% discount on all Christmas Stamps. 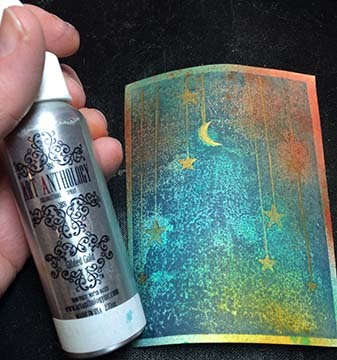 The new Celestial Dangles stamp is incredibly versatile -- I used it in the last issue of Inkspirations with Gelatos, and today I am using it with sprays. 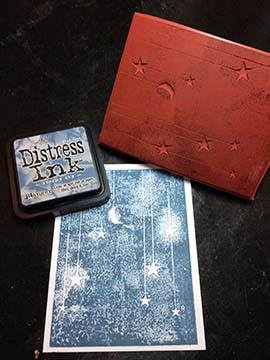 Stamp the Celestial Dangles image on plain cardstock using dark blue ink (I used Stormy Sky Distress Ink). 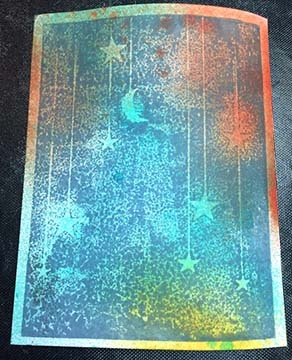 Spray the background with 2 - 3 Colors of Art AnthologyColorations Sprays. I used Juicy, Waimea Bay, and Timeless. 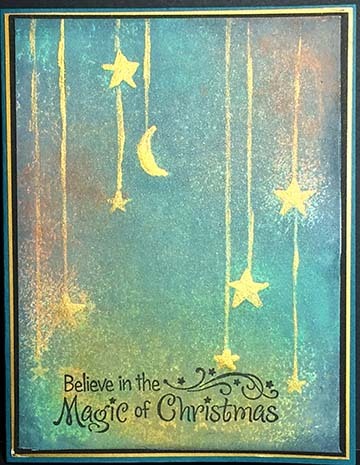 To add a gold shimmer to the entire background, I spritzed it generously with Gilded Glitz Fairy Dust Spray. It adds a gold sheen to the entire background. 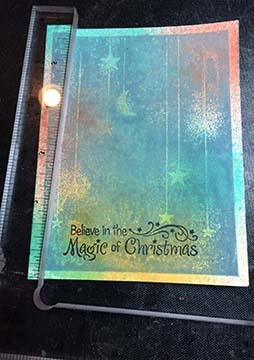 Use a stamp positioner to stamp the Magic of Christmas stamp along the bottom of the image. 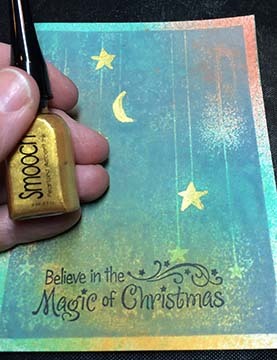 Color the dangles with Gold Smoosh Ink to highlight them. This card has amazing shimmer! It is so hard to see in the picture, but gorgeous in person. Day 30: Pat Huntoon: Celestial Dangles: You are HERE!